A great addition to any bikers wardrobe: Loving these gloves from Merlin. 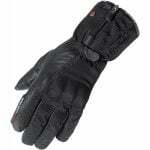 Leather sport style gloves with short cut for summer riding. Velcro closure, so they're easy to put on and take off. These are all about comfort: They've got pre-shaped fingers and an elasticated cuff for the perfect fit. There's a stretch panel to the back of hand and fingers and silicon grip offers grip on the handlebars.